Only a few speedy/talented folks will ever be able to profit directly from riding their bicycles, but even those of us who can’t make money on the bicycle can keep more money in our wallets by replacing car trips with bike trips. While some people are motivated to ride through their environmental commitments or a desire to live a more active life, many people are motivated by the almighty dollar. A recent study has made headlines by putting a dollar figure on being stuck in traffic – showing that the average driving commuter wasted $713 in lost fuel, time, and the increased costs associated with everyone else on the road being delayed as well. When you compare the cost of driving vs. biking, bicycles win. When comparing the owning and operating costs per mile over typical use, the cost of driving is over 300% more expensive than riding a bicycle. Even if you own and use your car, but ride your bike when possible, your bicycle costs per mile are still a fraction of your driving costs. This doesn’t take into account the additional health benefits, environmental contribution, or other feel-good benefits of cycling that are a little harder to convert into dollars. Students in the Netherlands made this video to compare cycling/driving. 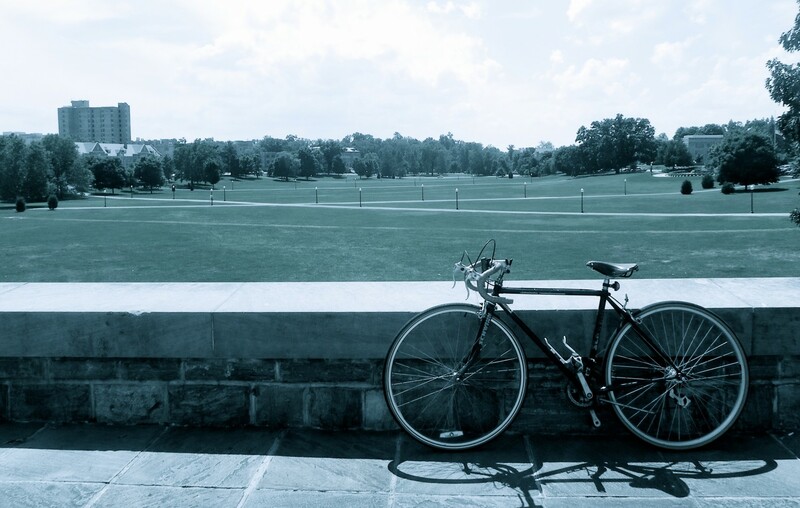 Because cars at VT pay for the opportunity to park, riding your bike can have immediate financial benefits – a bike/bus commuter who uses Bike, Bus & Walk parking permits saves money over a commuter (at least $168, annually) who holds an annual pass before either has left his/her driveway. The less-tangible, feel-good bonus associated with these financial savings is that the proceeds from those permits go toward improving very facilities/services that permit holders use – such as the recently installed covered bike parking area behind Patton Hall. Gas costs per gallon motivate people to do all kinds of things to use less gas when they drive; however, cyclists in the U.S. displace 238 million gallons of gasoline per year simply by using their bicycles instead of cars. One of the easiest ways to decrease your gas costs is to decrease the number of short trips you make by car. Cars typically have their worst fuel efficiency at the beginning of a trip, and stop-and-go traffic leads to engine idling and an endless loop of brake-accelerate all the way down the road, which just wastes more gas, ergo more dollars. Replacing short local trips with two wheels (as opposed to four + a combustion engine) prevents gas from being wasted in traffic, saving those precious gallons for trips out of town – where you’ll get higher fuel efficiency on your longer drive. If you’re concerned about the logistics of carrying groceries, furniture, or other products that comprise your reasons for taking short trips, the Bicycle Transportation Alliance has some sound advice. These are indirect profits that only benefit you if you haven’t started riding regularly already. If your goal is to actually profit from bicycle use, you have two options: a) save/invest the money you don’t spend on car expenses, or b) actually find a way to make money while cycling. If you are particularly industrious, you may be able to use bicycles to flatten your entrepreneurial costs, as some new businesses for the new economy have recently attempted (exhibit A and exhibit B). Whether or not you find a way to turn a profit, the financial benefits of replacing car trips with bike trips can at least translate into more money to spend on other living expenses or fun-time pursuits. ← New Bike Racks Coming Soon!